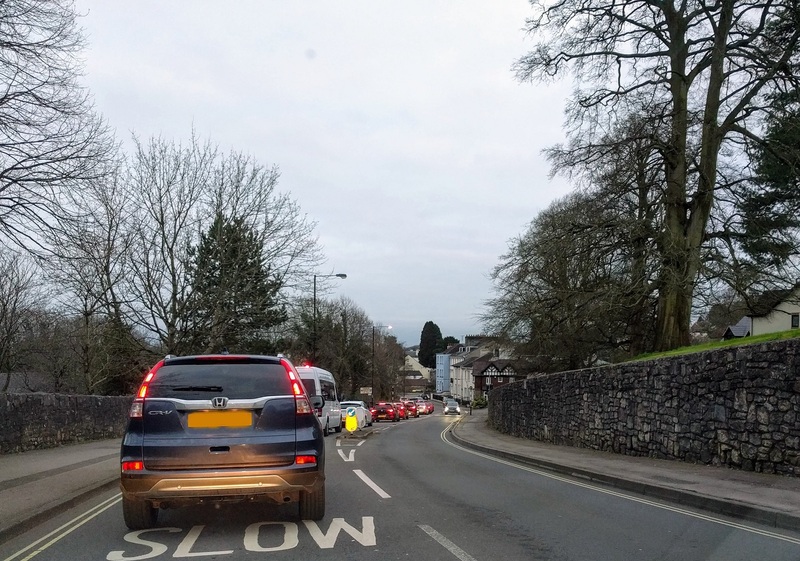 Thursday 11th April 2019 saw a fantastic turnout to a Congestion Free Chepstow public meeting. 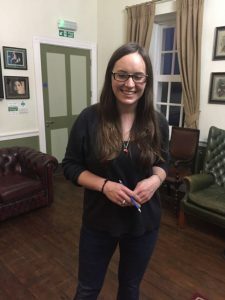 The meeting explored options for swiftly reducing congestion and air pollution in Chepstow, which has one of the highest rates of air pollution in the UK. 100% of politicians invited attended and over 270 members of the public including Chepstow town councillors, and councillors from surrounding areas including England. It quickly became apparent many solutions need cross border collaboration. There were several in depth presentations including proposals for changing the layout at High Beech roundabout, lift sharing and encouraging more children to walk to school. Members of the public also put forward suggestions including improving public transport, increased active travel and a Hays Gate junction to divert traffic from Rogiet and Caldicot off the High Beech roundabout. Transition Chepstow in partnership with elected representatives will pursue swift solutions to congestion and air pollution to make sure they are implemented. There was also very strong support for a bypass, but this was outside the remit of the meeting, which was focusing on swift solutions. 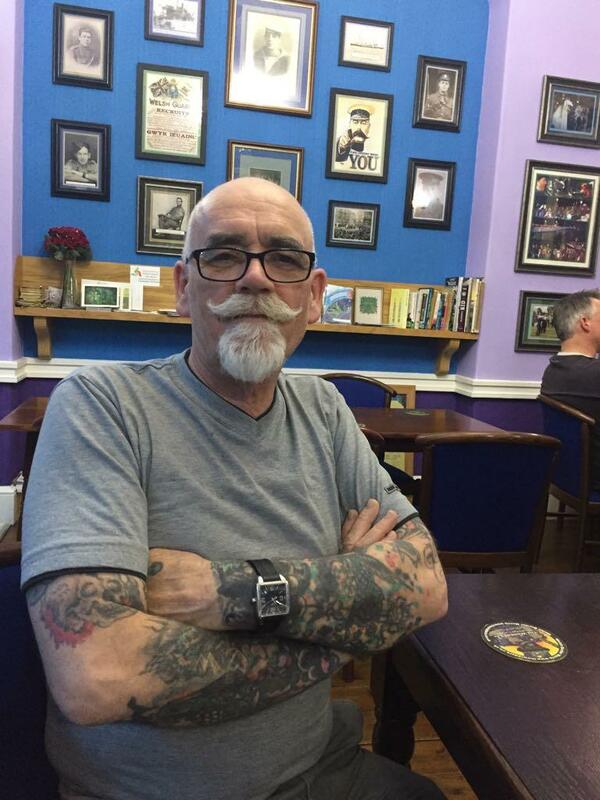 Anyone wanting to get involved in shaping the proposals should contact Tim at transport@transitionchepstow.org.uk. People with a good knowledge of public transport infrastructure developments would be particularly welcome. If you would like to find out more about our projects or events, or to get involved, please get in touch! Several cities including Manchester, Bristol, London and now Forest of Dean District Council have declared a “Climate emergency” with the intention to reduce carbon emissions to zero by 2030 or 2038. A similar motion is being raised in Monmouthshire County Council. Letters and emails to local councillors will help support developing and implementing best practice methods for limiting global warming to less than 1.5 degrees. Read below about a local family’s experience cutting down single-use plastics. Watched the last episode of Blue Planet, we were all nearly in tears. It was heart-breaking to see the devastation caused by many types of plastic to so many wonderful sea birds, mammals and fish. And with David Attenborough’s closing words about how it’s all our responsibility to act to save the planet ringing in my ears I am resolved to quarter this family’s consumption of single use plastic by the end of January. Until Blue Planet I had always kidded myself that as long as I tried to recycle everything and picked up any plastic litter I found lying around I was doing my bit. Now I realised I really did have to cut down as well. That’s it! Along with the usual resolutions to lose weight and get fit, this year is going to see this family attempt to eliminate single use plastic from our home. And unlike the first two resolutions I am determined to keep the last one. My first act is to buy more plastic, but not the single use variety. I have invested in a Soda Stream and a water filter jug. My grandson and I like sparkling water, my daughter likes coke and my granddaughter likes fruit squash, all of which come in plastic bottles. No more, it’s a bit of a faff but we are getting the hang of fizzing up our own water and, if wanted adding some flavouring from a bottle of concentrate (sadly single use and not very easy to find). Sometimes it’s too much of an effort so we have to fall back on simple tap water and find we all quite like it. We are saving at least 4 large single use plastic bottles a week (and a load of sugar and artificial flavourings) this way and I feel quite smug. Even smugger now I have put the last plastic hand soap dispenser ever to be allowed through the door, into the recycling. I had forgotten how long a tablet of hand soap can last and how nice and nostalgic some of the smells are. True the children can turn them into a soggy pulp if they get left lying on a flannel and I certainly have to clean the basins more often but it’s a small price to pay for the ever-increasing sense of virtue and the money saving. And this change could not have been easier to do. Must confess we haven’t yet quartered our consumption of single use plastic but the purple recycling bag that gets put out each week is certainly less full. Another easy win has been switching to butter in foil wrapped pats from plastic tubs of “spread”. The improved taste especially on toast has been remarked by everyone. Reducing single use plastic in our purchase of fruit and vegetables has not been so easy. I buy loose when I can but in Chepstow that is really limited to some potatoes, carrots, onions and occasionally broccoli. As far as fruit is concerned the only unwrapped types are some citrus fruit. Apples, pears and all soft fruit are always wrapped in plastic. I approached customer services in both Tesco and Marks and Spencer’s to ask if there were any plans to reduce their use of plastic packaging. Given the amount of publicity recently over the problems of single use packaging I had expected both to have some carefully prepared statement of good intent to give me but no, both stores greeted my question with polite astonishment and said they were not aware of any change in approach. Marks and Spencer did add though that they are entirely carbon neutral in all their operations! I could go to the market in Newport for fruit and veg most of which is still sold loose there and I resolve to do that from time to time. However it isn’t a realistic option on a regular basis and I wonder what the net environmental impact would be when the petrol involved in the 38 mile round trip is taken into account. With two young children in the household one of the biggest items in our weekly shop is milk. This comes in large single use plastic bottles and about 6 of these go into the recycling every week. I investigated what the alternatives might be but there don’t seem to be any. Even the very few doorstep milk-rounds left deliver in plastic bottles and local farm shops also only sell milk in plastic bottles. But we have had another success this month. 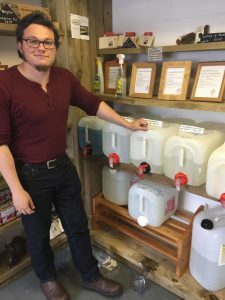 I now buy laundry liquid, fabric conditioner and washing up liquid from the fantastic Monmouthshire Upcycle centre down by the station. I take down the old bottles and get them refilled. It’s a bit more expensive than the stuff in a supermarket but is very good quality and less full of questionable chemicals and additives. Easter like Christmas proved a difficult time to omit plastic. After some dodgy looks from shop staff I gave up squeezing and peering into Easter egg boxes to see which contained least plastic. Interestingly when the boxes were opened by the children some contained virtually no plastic while others had everything triple wrapped. These were all common high street brands so if some can do it why can’t others? Depressingly I realised that not only were things like crisp bags and biscuit wrappers all plastic lined there also seem to be no alternatives, even the premium brands use plastic. While we are cutting down on things like crisps for health reasons I fear we cannot eliminate that source of plastic from our weekly shop, the children would never forgive me. Is buying things in glass or cans better than plastic? I decided to try and find out but my on-line research was inconclusive. Glass and tin is more easily re-used and more widely recycled but is more expensive to produce and, because it is heavier, increases the fuel needed to transport it. But, I rationalise probably does less damage if it ends up in seas and rivers. I therefore look for glass or tin alternatives where possible, things like cooking oil, jam etc but more and more of those products traditionally sold in glass bottles and jars now are only available in plastic. My grandsons school has organised a plastic litter pick. We set off to the local playing field and playground with two carrier bags which were full to overflowing within minutes with drinks bottles and crisp packets. I meant to go back with bigger bags but never managed to, but I do now always try and carry a spare bag when walking and pick up what I can. The main culprits round us seem to be teenagers, one tells me they would be laughed at if they were seen putting their litter in a bin rather than tossing the empty bottle into a tree. Somehow it needs to be made something to be admired amongst that age group. We went away for half term and all my good habits went to pot. Nearly all drinks and food in airports and on budget flights are now served in single use plastic. The Chepstow Sunday Market however got me back on track. Lovely produce available, most with no plastic packaging. The Upcycle people were there so I got our laundry liquid, fabric conditioner and washing up liquid refills. 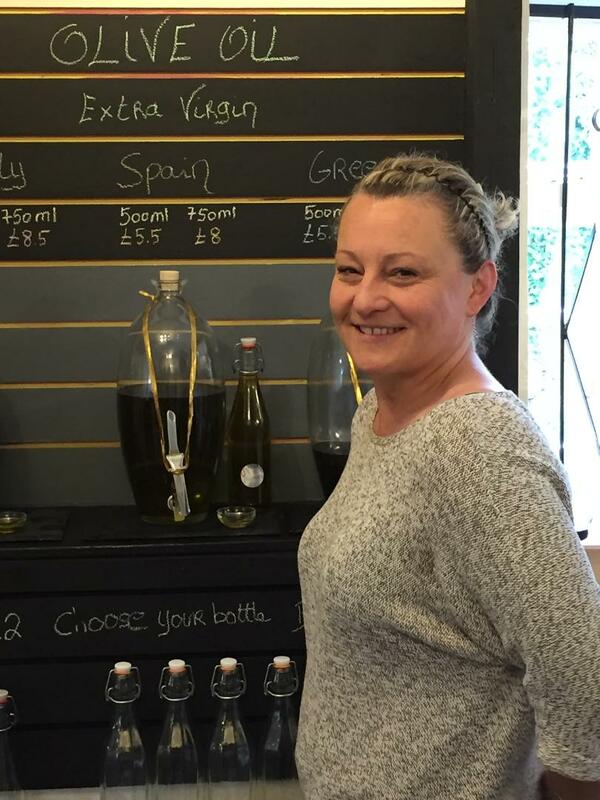 Also discovered that the Tell Me Wine shop in Rifleman’s Walk has a refill system for oil and vinegar and best of all wine! And… stop press… Tesco have now increased the amount of loose fruit they sell to include four different types of apples and some pears. Hope they keep up the good work. So nearly six months on what have we achieved? Laundry liquid, laundry conditioner, washing up liquid, soap, shower gel, toiletries with micro beads, soft drinks. And wine! Milk, soft fruit, most veg. In fact most supermarket food. 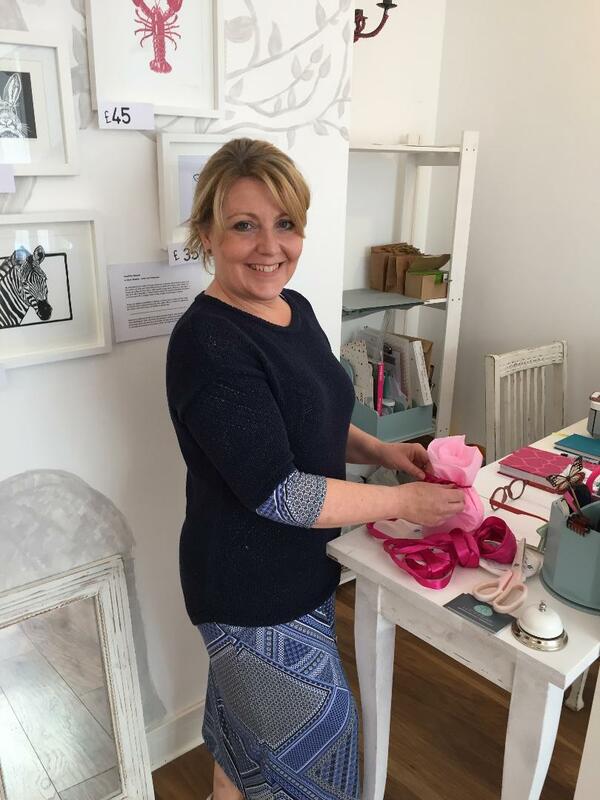 Read more about the Plastic Free Chepstow campaign! 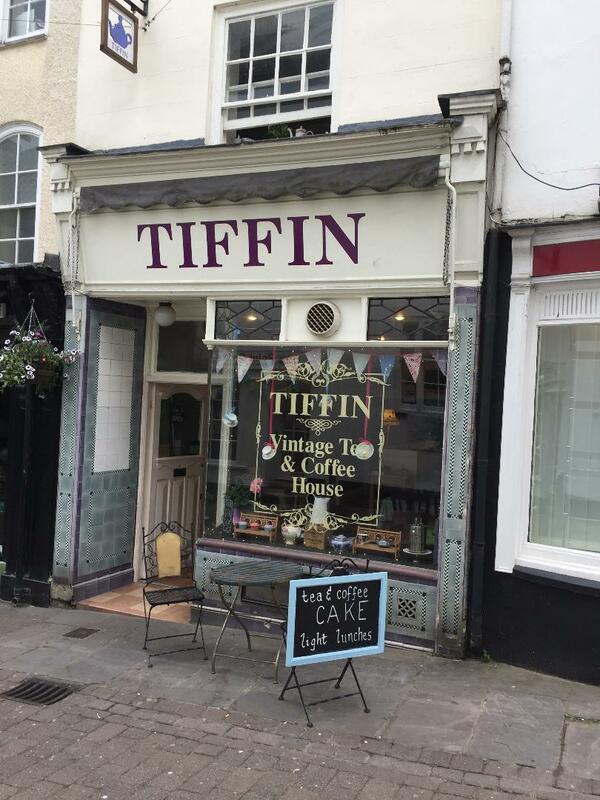 So far, 20 Chepstow businesses have signed up to say that they are committed to reducing single-use plastics as part of the Plastic Free Chepstow campaign. Some have already cut out at least three items, some are completely plastic-free, others are working on it. Heading the list of plastic free heroes is Monmouthshire Upcycle, whose eco-store on Station Road sells a range of household products that buyers can refill their own containers with, such as washing up liquid, cleaner and laundry liquid, as well as shampoo bars, bamboo toothbrushes and cotton bags to replace plastic ones when buying loose vegetables. Cherished Earth Wholefoods also sells refill products and will refill customers’ water bottles. Owner Iain Mills is a founder member of Plastic Free Chepstow, and the business is trying to cut out all single use plastics. 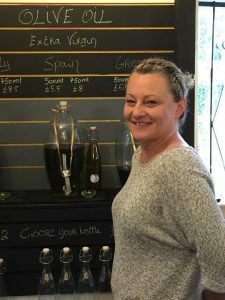 At neighbouring Tell Me Wine on Riflemans Way customers can refill wine and olive oil bottles, they are using paper packaging where possible and encouraging customers to re-use bags. 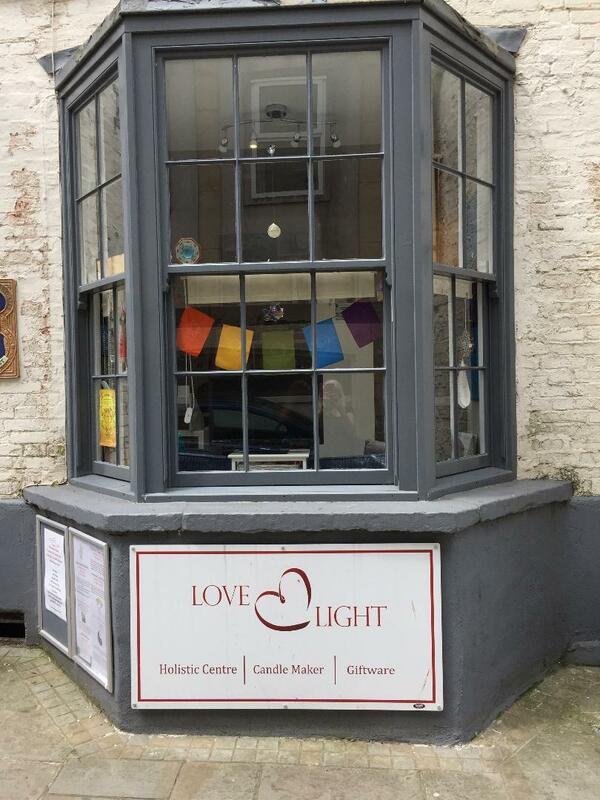 Nearby Love and Light, alternative medicine practitioners, are also phasing out single use plastics. 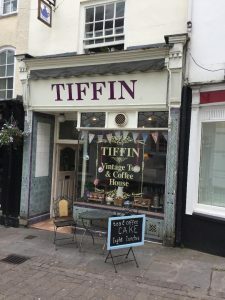 Tiffin Tea Rooms has phased out plastic straws, uses refillable bathroom products and offers a 10% discount to customers who bring their own cups for takeaway coffee. 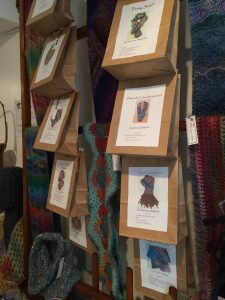 The Greenman Backpackers Hostel is also looking to get rid of all single use plastics, for example using paper bags instead of plastic for packed lunches. 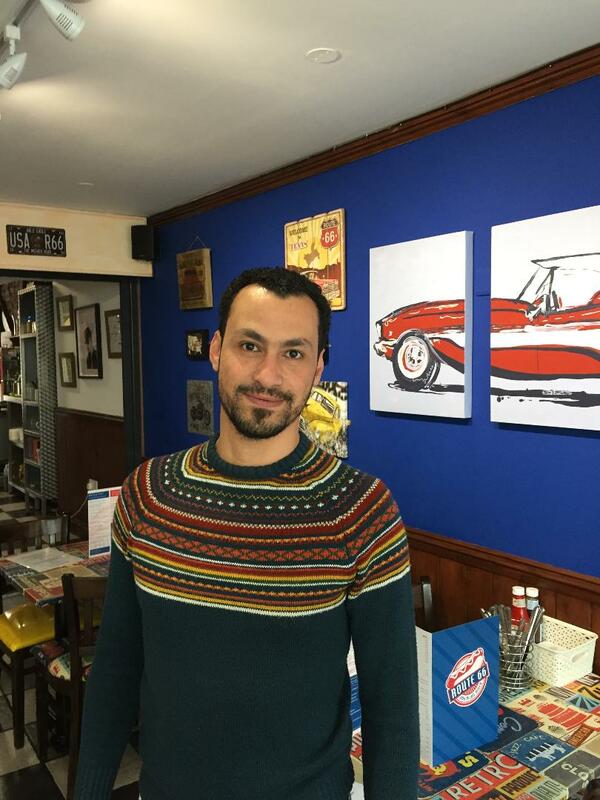 Diner Route 66 is replacing polystyrene cups and food containers with non-plastic alternatives, and using wooden stirrers and skewers. 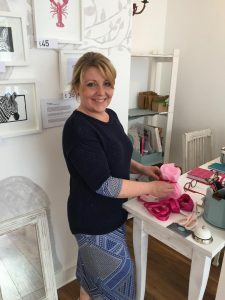 Jenny Skelton of jewellers Silk Road Bazaar is also delighted to see the Plastic Free movement taking off in Chepstow. 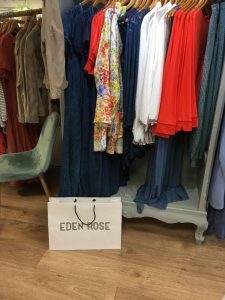 Laura Jones of fashion and lifestyle business Eden Rose is keen not to create additional plastic. 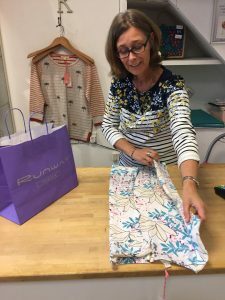 She has replaced plastic carrier bags with recycled paper, and is now using brown paper instead of plastic mailing bags – as well as a reusable coffee cup for her coffee breaks! Near Chepstow, Maybee Glamping has given up all single-use plastics. Chepstow Bookshop will be cutting out plastic bags and plastic-wrapped greeting cards, and is looking at alternatives to plastic packaging for its mail-order businesses. 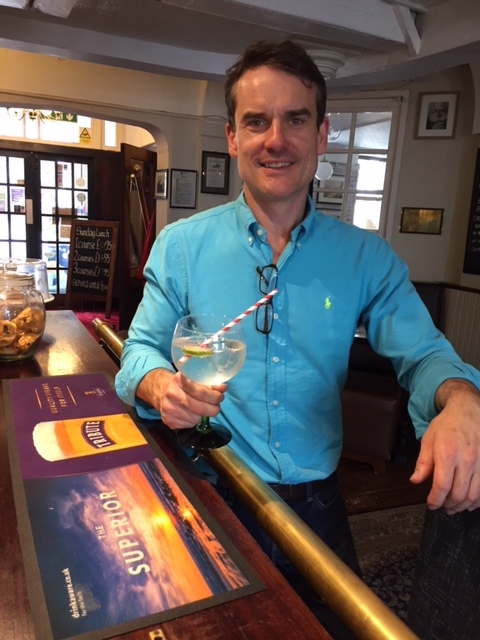 Matt Taylor explained that what motivated him to sign up for Plastic Free Chepstow was reading the book No.More.Plastic. 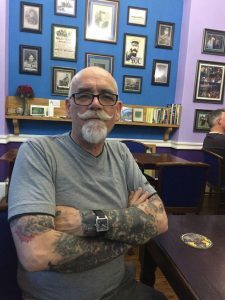 – whose author Martin Dorey spoke in Chepstow recently. 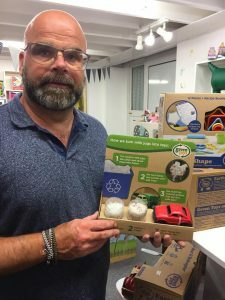 Toytastik stocks a range of recycled and plastic-free toys, is replacing plastic bags, and working where possible with suppliers who don’t use single-use packaging. Jon Amphlett was influenced by watching Sky News Ocean Rescue. Gail Gilliland of pottery studio Paint on Me gave up plastic straws when she learned that they could last for up to 200 years. Since then, she has also moved to paper bags and tissue instead of plastic-coated boxes, gave up disposable plates and cups and also switched to bio-degradable glitter. 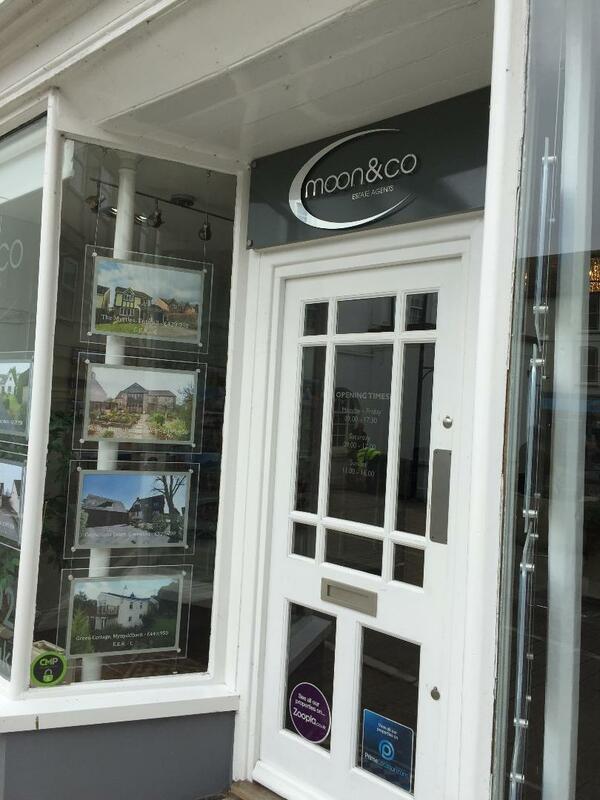 Language specialist Moore Language Solutions has switched to refillable ink cartridges and given up plastic parcel packaging. 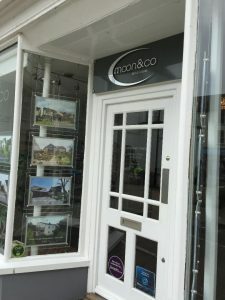 Estate agents Moon and Co. are phasing out all the single-use plastics in their business, and have also signed up to refill water bottles, as has another leading local estate agent Archer and Co. The Preservation Company and Stone Rock Pizza are the latest two companies to sign up. It is no coincidence that these are local, independent businesses. It makes business sense too. Although some substitutes for plastic are a little more expensive, there is inevitably going to be more and more legislation on single-use plastic over the coming months and years. Companies who are looking at alternatives now will be ahead of the game. It’s not just commercial businesses who have a part to play. 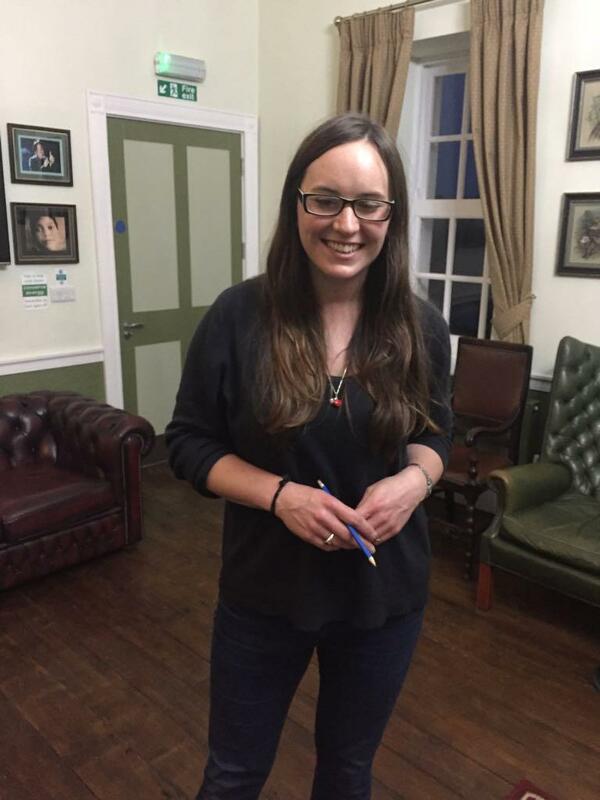 Chepstow Town Council resolved in March 2018 to cut out single use plastics from its own premises and the events it supports. 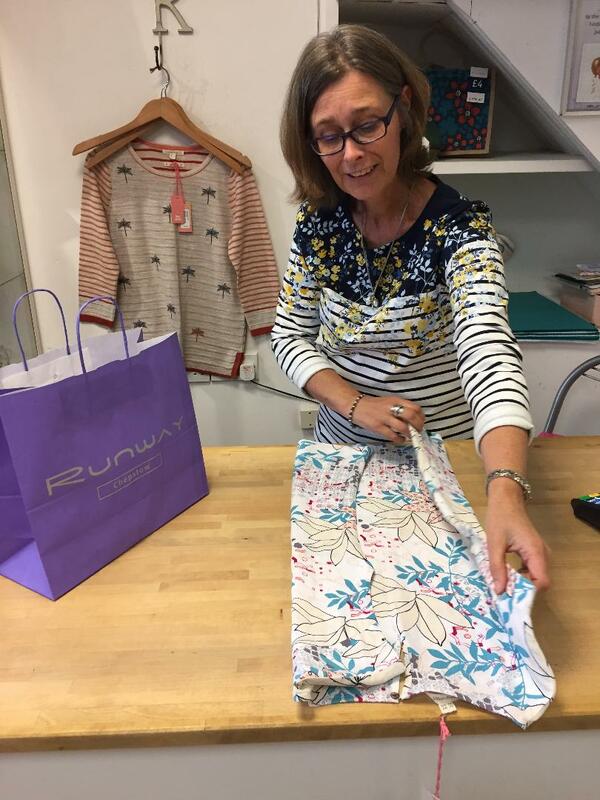 Local community centres Bulwark Community Centre and the Palmer Centre have signed up to become plastic free, cutting out items such as plastic straws, cups and cling-film. Chepstow Methodist Church and Chepstow Baha’I Faith are taking similar measures. Chepstow Library is also participating. If you are running a business in Chepstow and want to reduce the amount of single-use plastic in your business please get in touch with us at plasticfree@transitionchepstow.org.uk or through our Facebook page. We are aiming to get at least 30 businesses formally signed up as being plastic free by the end of 2018.